Artists Without a Cause e.V. 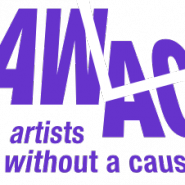 (AWAC) strives to create a symbiotic relationship between artists working in the political and social field with organizations and activists who are championing a cause. We want to bridge the gap and create a common language between goal- oriented and focused activists and process-oriented artists working on the same issues. We aim to connect organizations and activists who are interested in engaging with audiences and participants using new, diverse and creative methods with artists who create socially and politically engaged artwork. We aim to connect artists working in a contextual manner with the organizations and activists who are building the knowledge bases essential for their production and expansion of their work. For our first major project we were invited to bring five groups of international artists to the Open Knowledge Foundation´s OKFestival 2014. Posted on July 13, 2014. Filed under * Feature, EXPERIMENTAL / RADIO ART, PODCASTS.